Recently my kids admitted that they sometimes don't eat bananas and let them turn brown on purpose, knowing that I will use them to bake something. So I am always on the lookout for new banana recipes to try. Like most of the banana recipes I have previously posted, this cake recipe is one of those "what am I going to make with all these ripe bananas?" recipes. Do you have ripe bananas sitting on your counter? 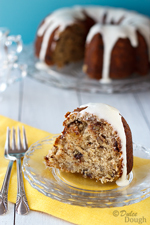 Give this Banana Chocolate Chip Bundt Cake a try! It is a delicious alternative to banana bread and is just as simple to make. As much as I enjoy making layer cakes, I love the simplicity of bundt cakes. Because of the beautiful shape of the pan, I often don’t add anything else to the cake. Yet if I want to, it is so easy to dress up a bundt cake with a simple glaze or a dusting of powdered sugar. My favorite bundt pan is my Nordic Ware Platinum Collection Bundt Pan. My cakes always turn out wonderfully when I use this pan. The cakes bake evenly and release easily out of the pan. Sometimes I grease and flour the pan, but I also get excellent results using a baking spray (which is what I used for this banana cake). 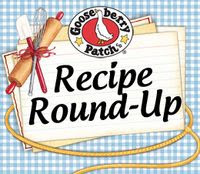 Do you have any favorite banana recipes? Moist banana cake with chocolate chips, walnuts, and rum glaze. 1. Preheat oven to 350°F and spray bundt pan with baking spray.2. Combine flour, baking powder, baking powder, baking soda, and salt; set aside.3. In a large bowl cream together the butter and sugar until fluffy; add the eggs and beat until combined.4. Add the mashed bananas, sour cream, and vanilla and mix until combined.5. Gradually add the dry ingredients to the wet ingredients and mix until just combined.6. Gently fold in the walnuts and chocolate chips.7. Pour batter into prepared bundt pan and bake for 40 - 50 minutes or until a toothpick inserted into the cake comes out clean. 8. Cool cake in the pan for 5 minutes, then invert onto a cooling rack and cool completely.9. To make glaze, combine butter, confectioners' sugar, and vanilla; gradually add the milk 1/2 tablespoon at a time until the desired consistency is achieved. 10. Pour glaze over cooled cake and serve. Cake recipe adapted from Cake Keeper Cakes by Lauren Chattman. I love everything about this. And the rum glaze, oh my goodness. This is gorgeous! Love the recipe soooo much!! I love bundt cakes as well. You can keep all of the sugary sweet frosting's. All my piece of cake needs is a little sprinkle of powdered sugar and I'm a happy girl. This cake looks awesome! I wish my kids would allow our banana's to brown so I could bake with them! What a beautiful bundt cake. I love the look of bundt cake and have been dreaming of making it one day. Thanks for your recommendation of mold. I was about to research which one is good, so thank you for your recommendation! Your cake is so beautiful and flawless! The cake with glaze is beautiful! You have a beautiful banana cake with chocolate chips, amamzing! And to top it off, rum glaze, yum! Wow, this looks gorgeous! Love bundt cakes, simple and beautiful. The combination of bananas, chocolate and walnuts sounds divine. And if that's not all, the rum glaze is taking it to a whole other level. Yummy!!! Your kids are quite clever! My mouth is watering looking at this beautiful cake. I devour bananas, but when they start to turn brown, I will freeze them and use them in smoothies. Ripe bananas are always available in my home. usually they end up as banana bread. This sounds good alternative to banana breads. I make a banana chocolate chip bread but this cake sounds incredible especially with the addition of rum. I love bundt cakes but don't make them often enough. Great recipe! What a gorgeous bundt cake! I have a few of bananas in the freezer cried out loud to be used. Thanks for sharing it! Love this! I was just looking for banana recipes since I have 2 very brown-black bananas sitting on the kitchen counter. I usually make a banana rum bundt. Adding chocolate chips would just take that to another level. YUM! Ha-I see all those comment above regarding the "extra" bananas, so you have inspired several people to make this! It does look tasty, especially with the chocolate chips. Bundts by far are some of the most flavorful cakes of all and this recipe is one not to miss. Thanks for sharing it! Overriped bananas are never as good as when they are mashed and baked. I love banana recipes too. Thanks for sharing! I always forget that bananas ripen quicker in the warmer weather and it's definitely becoming that season again. I have so many in my freezer to bake with...and this cake is definitely now on the list of recipes I want to make. Love the banana and rum pairing! My mouth is watering!! Wow, and your photos are so beautiful!! Clever kids! Your cake looks delicious! Wooow.... un rico pastel de plátano es lo máximo,siempre hay plátanos maduros en mi casa ,haré este hermoso pastel luce perfecto,abrazos hugs,hugs. Jill, this cake is just divine...boy, I'd love to have a piece right now! The rum glaze really adds a unique touch! You've got some pretty clever children...I prefer my bananas in baked goods too! This looks heavenly. I could go for some of this right now. What a great way to use bananas! My favorite banana recipe is a chocolate chip cinnamon banana bread. Now that I think of it, I haven't posted that one. I've got to add it to my blog! I could definitely use this in my belly right now! Love the addition of the glaze to the cake. Beats frosting any day! Oh...this something different, I used to see banana bread, but never a bundt cake. Yes, this is a very good idea. Lucky me discovering all these yummy bundt cake recipes. I, like you love making bundt cakes. They are the perfect way to indulge in cake without all the frosting that comes with layers. I love the chocolate/banana combo. Saving this one for sure.